Bagnet, to put it simply, is crispy fried pork belly, a cross between Chicharon and Lechon Kawali, where the lean meat is crispy but not dry and the pork skin with all the pork fat is fried to a crisp. Though not like Chicharon -- which is merely crispy pork skin, and unlike Lechon Kawali -- where a whole liempo is fried and cut into cubes so the only crispy portion is the pork skin, bagnet is crispy from the skin, fat and the lean meat. It is usually served with a dipping sauce of Fish Paste (Bagoong Isda) with chopped red or white onion, tomatoes and green onions. 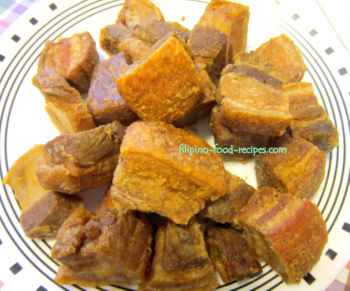 The process is basically the same as that of making Lechon Kawali, except that the pork is cut into cubes and fried twice. Cutting the pork in cubes allows for all the sides of the pork to be in direct contact with the hot oil and get crispy. Frying is done in 2 stages -- first at a lower temperature, about 300°F to 325°F to dry out the moisture without splattering the oil. The moisture that makes the oil splatter is from boiling in water to soften and season the pork (like in Nilagang Baboy). The meat is set aside to cool down, an important step, to dry out the the pork a bit before the last fry. The final frying is in fairly hot oil, like 375°F to 400°F until golden brown. 1 In a large pot over medium high heat, boil the pork belly with the water. Spoon out the grayish meat protein that floats on the water and discard. 2 Turn the heat down, add the garlic, onions, salt and peppercorns and simmer for 20-25 minutes or until the pork is slightly tender, but not falling apart. 3 Scoop out the pork and pat it dry with paper towel before deep-frying at fairly low temperature (about at 300 - 325 °F;) until slightly browned. 4 Set aside to thoroughly cool down and keep in the refrigerator uncovered for at least 4 hours or, better yet, overnight. 5 Fry at 400°F; oil until golden brown. 6 Serve with rice and bagnet dipping sauce of Fish Paste (Bagoong Isda) with chopped onion and tomatoes. You could make a big batch by cooking up to the first frying, then set aside inside the refrigerator up to a week, or in the freezer up to a month. Fry in hot oil when you feel like having them. The recipe is just like that of lechon kawali, except that this one is cut in cubes and twice-fried to dry out the pork fat and skin. Again, in any deep frying, safety in the kitchen should always be your number one concern and deep-frying can be pretty dangerous so take the necessary precautions. The frying pot should not have more than half full of oil. Spill-over oil can cause fire. Remember that water on oil can cause splatter - thus, boiled pork on heated oil, even if the oil is at a lower temperature, so be extra careful.